- Diagnostic and therapeutic procedures as medically necessary during ER and confinement. *Take note: Health Vantage cannot be activated along with the other vouchers such as ER Shield, ER Vantage, Dengue Assist and ER Health Assist at the same time with the same person. When worse comes to worst, Health Vantage is there for you. Health Vantage 40 for Adults is for clients aging from 18 to 64 years old. However, entry age is up to 60 years old only. This card is valid for 1 year upon activation date. Our intense focus on the customer inspired us to pioneer innovation and transform customer experience through digital channels. Find a provider through PhilCare’s mobile app, HeyPhil! Check your health program, transactions, and the latest news about health and wellness through our interactive portals. Easily repurchase your health plan through our e-Commerce site and talk to us and your co-PhilCare members through our social meida sites. Digital channels promote convenience and speed of service delivery to our members. Health Vantage does not require medical examinations (for purchase) and hospital deposit (for availment.) It is accepted in 500+ Philcare-accredited hospitals nationwide excluding six (6) major hospitals in Metro Manila (Makati Medical Center, St. Luke's Medical Center (QC and Global), Asian Hospital and Medical Center, The Medical City, and Cardinal Santos Medical Center). 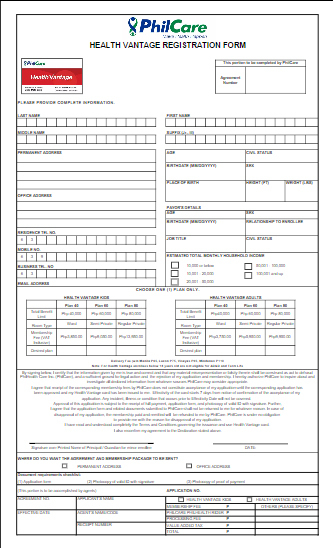 Step 1: Submit an accomplished application form to order@philcare.com.ph once payment has been made. Download application form here.